If you really want all to go all out, you can embed from all the services below using the Embedly plugin for WordPress. This is an example of Embedly used to embed a Tumblr post. YouTube — YouTube is the world’s most popular online video community, allowing millions of people to discover, watch and share originally-created videos. YouTube provides a forum for people to connect, inform, and inspire others across the globe and acts as a distribution platform for original content creators and advertisers large and small. Justin.tv — Justin.tv is the largest online community for people to broadcast, watch and interact around live video. Twitch.tv — TwitchTV is the world’s largest video game broadcasting and chat community. UStream — Ustream is an interactive platform that enables anyone with a camera and an Internet connection to quickly and easily broadcast to an online global audience. In less than two minutes, anyone can become a broadcaster by creating their own channel on Ustream or by broadcasting through their own site. Qik — Qik lets you share your everyday life experiences as it happens with your family and friends – right from your mobile phone. Revision3 — Revision3 is the leading television network for the internet generation. We create and produce all-original episodic community driven programs watched by a super-committed and passionate fan base. Our hyper-connected audience gets the vast majority of its entertainment, information and social connections through the internet. Daily Motion — Dailymotion is about finding new ways to see, share and engage your world through the power of online video. You can find – or upload – videos about your interests and hobbies, eyewitness accounts of recent news and distant places, and everything else from the strange to the spectacular. College Humor — CollegeHumor is the #1 comedy site on the internet. We showcase hilarious original videos, articles, contests, and interactive features, as well as pictures and videos submitted by fans like you. Our in-house writing and production team powers CH Originals, which delivers original, TV-quality comedy videos multiple times a week. Telly — Telly is a fun and simple way to collect and share cool videos you find. Break.com — Watch funny videos and video clips at Break.com. Our editors find the best funny videos, clips and pictures for you to watch right now. Myspace Videos — MySpace is a technology company connecting people through personal expression, content, and culture. MySpace empowers its global community to experience the Internet through a social lens by integrating personal profiles, photos, videos, mobile, messaging, games, and the world’s largest music community. MetaCafe — Metacafe is a social video site that algorithmically filters what appears on the site. Users and content producers are allowed to submit any videos they want but Metacafe uses its filtering algorithm VideoRank to choose the \most entertaining\ and \high quality\ videos. Blip.tv — More than 48,000 independently produced Web shows use blip.tv to reach more than 22,000,000 people. We distribute more than 2.4 million episodes from these shows across the entire video Internet and onto television screens across the country. Google Videos — Google Videos is a free video sharing website and also a video search engine from Google Inc. Google Videos allows selected videos to be remotely embedded on other websites and provides the necessary HTML code alongside the media, similar to YouTube. Yahoo! Video — Yahoo! Video is the best place to view and upload video on the Web. It’s the perfect pop-culture mashup, the best of the best-all video from across the Yahoo! network in one place. Of course we have unicorns, chipmunks, ninjas, cats, and robots. We also have music videos and news, sports, autos, comedy, TV clips, and movie previews. Viddler — A fresh, creative web application that allows you to upload, enhance, and share digital video easily and quickly inside your web browser. LiveLeak — LiveLeak is a video sharing website that lets users post and share videos. LiveLeak places emphasis on current events, politics and reality-based footage such as war scenes from various parts of the world. Animoto — Animoto automatically produces beautifully orchestrated, completely unique video pieces from your photos, video clips and music. dotSUB — dotSUB is a browser based, one-stop, self contained system for creating and viewing subtitles for videos in multiple languages across all platforms, including web based, mobile devices, and transcription and video editing systems. Overstream — Have you ever wanted to customize an online video by adding your own comments or subtitles in any language, or wanted to send a custom video postcard? All of this is possible with Overstream: using the online Overstream Editor, you can easily create and synchronize your subtitles to any online video*, store them on the Overstream server, and send the link to the subtitled video overstream to your friends. Livestream — Watch live streaming video and chat online, or broadcast your own events in minutes. WorldStarHipHop — WorldStarHipHop contains videos about show, hip hop and entertainment. Bambuser — Live video streaming from your mobile phone or webcam. SchoolTube — SchoolTube.com is the nation’s largest K-12 moderated video sharing website that provides students and educators with a safe and FREE video sharing website that is exclusively endorsed by leading education associations. Big Think — Big Think is a global forum connecting people and ideas. JibJab — JibJab is an online entertainment studio dedicated to making things that make people laugh. You can create personalized \Starring You\ videos on our website, send ecards to friends on special occasions and watch original videos. xtranormal — xtranormal’s mission is to bring movie-making to the people. Socialcam — The easiest way to share videos with friends. Youku — China’s first video website, Youku features \quick play, quick release, quick search for\ all news, video and sports. snotr — Snotr is a source for short and funny or interesting video. Clipfish — Clipfish.de offers a wide variety of cutting-edge video from the TV, music, comedy, movies, games, and news and lifestyle. MyVideo — At MyVideo you can find the best free videos and clips. vzaar — vzaar’s professional video platform enables you to upload and publish video online. Features include player customisation, iPhone/iPad/HTML5 playback support, playlists, analytics, security settings and much more. Coub — Coubs are high-quality moving images with sound. They make it easy to turn videos into engaging, living photos, display your creative work in novel ways, and add pizzazz to your website or blog. Vine — Vine is the best way to see and share life in motion. Create short, beautiful, looping videos in a simple and fun way for your friends and family to see. Viddy — Turn everyday moments into fun little movies with Viddy — a simple way to capture, create, and share mobile videos with friends. Tudou — Tudou.com is the leading video sharing platform in China, where users can upload, view and share video clips. MixBit — Create videos together. Brainshark — Brainshark’s easy-to-use solutions enable static documents to be transformed into dynamic, mobile-ready content that can be accessed quickly and viewed as on-demand video presentations or presented live – anytime, anywhere. 23 Video — 23 Video, cloud video for companies and organizations. GoAnimate — GoAnimate enables people to produce a wide range of custom animated videos — from scratch — in the cloud — using drag & drop tools. Brainsonic — Brainsonic delivers ROI and engagement-oriented digital solutions to businesses for their social marketing and communication strategies by integrating video, social networks and new screens. Lustich — Das größte deutsche Spaß-Portal. Tausende lustige Bilder, Witze, Videos und vieles mehr – natürlich völlig kostenlos. Reelhouse — Reelhouse’s distribution platform connects viewers and creators. web.tv — Social Video Network; which enables limitless live broadcasting and video upload; provides to have your own webchannel with connection of other social networks. Mynet SahneTV — SahneTV, her ay internette boy göstermeyi seven yeteneklerin yarışmasına olanak sağlayan, izleyicilerin de bu yetenekleri oyladıkları eğlenceli bir platform. 59saniye — 59saniye, 1 dakikadan kısa videolar izleyerek zamanınızı dolu dolu geçireceğiniz bir video paylaşım sitesidir. Zie — Op zoek naar leuke en interessante video’s? Zie.nl, de nieuwe videosite van Nederland. uStudio — uStudio is a video management, hosting and distribution service. Kaltura — uStudio is a video management, hosting and distribution service. The White House — WhiteHouse.gov is the official web site for the White House and President Barack Obama, the 44th President of the United States. Hulu — Hulu is an online video service that offers hit TV shows, movies and clips at Hulu.com and other online destination sites – anytime in the U.S.
Crackle — Crackle, Inc. a Sony Pictures Entertainment Company, is a multi-platform next-generation video entertainment network that distributes digital content including original short form series and full-length traditional programming from Sony Pictures’ vast library of television series and feature films. . Funny or Die — Funny Or Die is a comedy video website that combines user generated content with original, exclusive content. The site is a place where celebrities, established and up-and-coming comedians and regular users can all put up stuff they think is funny. Vimeo — Vimeo is a cleanly-designed video sharing website that allows people to publish their videos for public consumption or just for friends and family. TED — TED is a small nonprofit devoted to Ideas Worth Spreading. It started out (in 1984) as a conference bringing together people from three worlds: Technology, Entertainment, Design. NFB — The National Film Board of Canada (or simply National Film Board or NFB) is Canada’s public film producer and distributor. An agency of the Government of Canada, the NFB produces and distributes innovative, socially relevant documentary, animation, alternative drama and digital media productions. . The Daily Show — The Daily Show is an Emmy and Peabody Award-winning program that takes a reality-based look at news, trends, pop culture, current events, politics, sports and entertainment with an alternative point of view. In each show, anchorman Jon Stewart and a team of correspondents, including Aasif Mandvi, Wyatt Cenac, John Oliver, Jason Jones and Samantha Bee, comment on the day’s stories, employing actual news footage, taped field pieces, in-studio guests and on-the-spot coverage of important news events. Colbert Nation — Feel the news along with Stephen Colbert, America’s ballsiest pundit, with highlights and full episodes of The Colbert Report. Comedy Central — Your Source for Comedians, Funny Video, TV Shows, Games, Jokes and Ringtones. The Onion — The Onion is an American news satire organization. It features satirical articles reporting on international, national, and local news as well as an entertainment newspaper and website known as The A.V. Club. It claims a national print circulation of 690,000 and says 61 percent of its web site readers are between 18 and 44 years old. Trailer Addict — TrailerAddict was created for those who understand what it means to be a fan of movie trailers. Getting to the theater early on purpose, we are bound by the knowledge that trailers are (at times) better than the films they represent. TrailerAddict has been built not for those who like a good trailer now and then, but those who understand that the need to watch trailers is a state of mind. TrailerSpy — At TrailerSpy, our goal isn’t necessarily to be the most popular trailer site on the web. Our goal is to be the best trailer site on the web. View movie, video game, book and many other trailers at TrailerSpy. FORA.tv — FORA.tv helps intelligent, engaged audiences get smart. Our users find, enjoy, and share videos about the people, issues, and ideas changing the world. GameTrailers.com — \Watch new video game trailers, read reviews and previews of upcoming video games at GameTrailers.com. Koldcast Tv — KoldCast TV, where the future of Internet-served television is taking shape. And where a new form of entertainment is incubated, featured, and introduced in new ways. Mixergy — Mixergy is where the ambitious learn from a mix of experienced mentors. PBS Video — On PBS Video, award-winning national programming and locally produced shows are just a click away. Watch your favorite shows and catch the episodes you may have missed, all on your schedule. TruTv — truTV is television’s destination for real-life stories told from an exciting and dramatic first-person perspective and features high-stakes, action-packed originals that give viewers access to places and situations they can’t normally experience. NZ On Screen — NZ On Screen is an online showcase of archival New Zealand television and film. Wistia — Wistia Video Platform allows you to host, share and track video. Confreaks — Expert recording services for conferences, seminars, and workshops. All Things Digital — News, analysis and opinion about the digital revolution. New York Magazine — Find and share videos at New York Magazine. Aniboom — The virtual animation studio. GrindTV — GrindTV.com is the world’s leading destination for action sports videos, pictures and information about the skate, surf, snow, and moto lifestyle. ifood.tv — ifood.tv is a place to make friends, chat about food, learn about cooking traditions and satisfy your culinary curiosity. Logo: Fierce TV — Watch Logo reality TV shows like RuPaul’s Drag Race and The A-List: New York, free full episodes online. Lonely Planet — Travel guides and guidebooks. Travel advice, tips and destination information to inspire you from Lonely Planet. Street Fire — StreetFire.net is the first and largest user generated video sharing service that specifically caters to car, truck and motorcycle enthusiasts. ScienceStage — ScienceStage.com is a virtual conference room, lecture hall, laboratory, library and meeting venue all in one. Brightcove — The Brightcove Online Video Platform: The easiest way to add video to your website. wireWAX — wireWAX the first taggable video tool. CANAL+ — Canal Plus is a French premium tv channel. VEVO — Vevo is the world’s leading all-premium music video and entertainment platform. Pixorial — Give all your videos a safe place to call home. Spreecast — Spreecast is the social video platform that lets people broadcast together. ShowMe — ShowMe is an open learning community where you can learn or teach any subject. Watch great lessons for free, or create your own. LoopLogic — LoopLogic provides online tools to quickly create on-demand video assets, convert anonymous viewers into leads, measure your content’s performance with actionable analytics, and integrate your contact’s actions with your existing CRM or learning management system infrastructure. AOL On — Turning on your day with everything you should be watching now. Video Detective — VideoDetective.com has over 60,000 movie trailers, TV previews, clips, international trailers, and interviews. Plus 5000 video game trailers and 20,000 music videos. Info on every title, including availability. Watch the trailer. Track the titles you like. Share the video with your friends. Khan Academy — The Khan Academy is an organization on a mission. We’re a not-for-profit with the goal of changing education for the better by providing a free world-class education for anyone anywhere. With a library of over 3,000 videos covering everything from arithmetic to physics, finance, and history, and hundreds of skills to practice, we’re on a mission to help you learn what you want, when you want, at your own pace. Vidyard — Vidyard is a powerful video analytics and hosting platform designed for content marketers. Veoh — Veoh is the premier watch movies online provider that you and your whole family are sure to love. Univision — Uvideos offers Spanish-language on-demand video content, free to all users on an advertiser supported basis, in the United States and Puerto Rico. Thousands of hours of video are currently available, providing access to the best Hispanic video content from TV networks such as Univision and Unimas. Users can discover videos based on what friends and others recommend, watch or interact with. Popular content includes telenovelas, international news, interviews celebrity gossip, and sports clips. Vidcaster — Vidcaster is a corporate video platform for sales, marketing, training, and compliance. The Vidcaster platform provides best practice workflows to intelligently publish videos that encourage, quantify and optimize viewer actions. Muzu.tv — Watch official music videos, documentaries, TV shows, interviews, behind the scenes, tutorials and loads of exclusive and rare footage. Vube — Vube is a new player in the Video Sharing space. We hold monthly contests and pay out thousands of dollars to the most popular videos uploaded by people just like you. Box Office Buz — An entertainment and pop culture website covering everything from gadgets and gaming to movies and comics. GodTube — Share and watch family safe videos online at GodTube.com. Upload and watch Christian, funny, inspirational, music, ministry, educational, cute and videos in Espanol FREE online. Media Matters — Media Matters for America is a Web-based, not-for-profit, 501(c)(3) progressive research and information center dedicated to comprehensively monitoring, analyzing, and correcting conservative misinformation in the U.S. media. Clikthrough — Clikthrough has created the technology that makes online video interactive within an online theater viewing experience. Clip Syndicate — ClipSyndicate is the leading video syndication platform that enables broadcasters and other video content producers to realize new revenue streams and extend their brand beyond their traditional market to the Internet. SRF — Im SRF Player k\u00f6nnen Sie zahlreiche TV- und Radio-Sendungen von SRF online ansehen bzw. anh\u00f6ren, wann und sooft Sie wollen. MPORA — Skateboarding, Surfing, Snowboarding, BMX, MTB, Motocross & Extreme Sports on MPORA – Pure Action Sports. J-Stream — J-Stream Equipmedia(EQ) is a Online Video Platform with Streaming CDN in Japan designed for marketers easy to use. Vice.com — VICE’s online den of nefarious activities, investigative journalism, and enlightening documentaries. VideoDonor — VideoDonor is a non-profit video sharing platform for transplant and donor related videos. LoveLive — We provide quality live music content to sites and brands. GitHub — GitHub is the best way to participate in that collaboration: fork projects, send pull requests, create issues, and monitor development with all of your public and private code. CrunchBase — CrunchBase is the free directory of technology companies, people, and investors that anyone can edit. Developed and Maintained by TechCrunch. SlideShare — SlideShare is a community for sharing presentations. Individuals or organizations can upload and share PowerPoint, PDF, or OpenOffice presentations. Anyone can find presentations on their topic of interest. Scribd — Scribd is the largest social publishing company in the world, the Website where tens of millions of people each month publish and discover original writings and documents. Screenr — Screenr allows you to make screencasts for your followers on Twitter as easily as you tweet. Just record, and a ready-to-tweet screencast is instantly created. Howcast — Howcast is the best source for fun, free, and useful how-to videos and guides. Screencast — Screencast.com is a TechSmith solution for business and academic professionals looking to manage and share videos, images, documents, or anything else online. Screencast.com’s high-quality content-hosting gives you complete control over how, when and to whom your content is distributed. Issuu — Issuu is the leading digital publishing platform delivering exceptional reading experiences of magazines, books, catalogs, reports, and more. Kickstarter — Kickstarter is a new way to fund creative ideas and ambitious endeavors. Scrapblog — With Scrapblog, your photos and videos become the stars of all the stories you want to tell. Foursquare — Foursquare gives you & your friends new ways to explore your city. LinkedIn — World’s Largest Professional Network. SlideRocket — Create, collaborate and share stunning, media-rich presentations. Google Maps — Google Maps, View maps and directions. Craigslist — Craigslist is a centralized network of online communities, featuring free online classified advertisements – with sections devoted to jobs, housing, personals, for sale, services, community, gigs, resumes, and discussion forums. My Opera — My Opera is a blog and photo sharing community with millions of members. Tumblr — Tumblr lets you effortlessly share anything. Post text, photos, quotes, links, music, and videos, from your browser, phone, desktop, email, or wherever you happen to be. You can customize everything, from colors, to your theme’s HTML. PollEverywhere — Inexpensive Audience Response System that uses audience mobile phones or the web. Features live, animated charts in PowerPoint and on the web. Quantcast — Quantcast helps publishers of all sizes understand the composition of their audiences and attract higher advertising rates, and helps marketers and agencies find elusive online audiences wherever they might be. Compete.com — Provides free information for every site on the Internet including site traffic history and competitive analytics. StatusNet — StatusNet is the open source microblogging platform that helps you share and connect in real-time within your own domain. Identi.ca — Identi.ca, a micro-blogging service based on the Free Software StatusNet tool. VZ Networks — VZ Networks is a popular German social networking platform containing three networks StudiVZ.net (college students), MeinVZ.net (non-students) and SchuelerVZ.net (high school students). Myloc.me — Myloc.me is the GPS location of any of your tweets sent through UberTwitter, Twitter clients for mobile devices. Pastebin.com — Pastebin.com is a website where you can store text for a certain period of time. Pastie — Pastie is one of the coolest paste apps ever. Redux — Redux is all about delivering the best personalized entertainment on the web. Redux taps into users’ friends and people that share their interests to deliver a uniquely addictive entertainment experience. CloudApp — CloudApp allows you to share images, links, music, videos and files. Here is how it works: choose a file, drag it to the menubar and let us take care of the rest. Speaker Deck — Speaker Deck, a service to share presentations. Kiva — Kiva’s mission is to connect people, through lending, for the sake of alleviating poverty. Timetoast — Timetoast allows people to create interactive timelines, which they can share anywhere on the web. Storify — Storify is a way to tell stories using social media such as Tweets, photos and videos. Meetup — Meetup is the world’s largest network of local groups. dailymile — dailymile is the easiest way to share your training with friends and stay motivated. Kinomap — Share and explore your videos on a map. MetaCDN — MetaCDN delivers your content to all devices, platforms and connections to maximise branding opportunities, audience engagement and retention. Prezi — Create astonishing presentations live and on the web. UserVoice — Feedback and suggestions for your users. Formspring — Formspring is a community of millions of people connected by one simple thing: curiosity about one another. Ask, Answer and learn about your friends. TwitLonger — Twitlonger is a way to let you post to Twitter when 140 characters just isn’t enough. Qwiki — Qwiki’s goal is to forever improve the way people experience information. crocodoc — crocodoc allows you to collaboratively highlight and comment on PDFs, Word documents, images, and more. Wikipedia — The free encyclopedia that anyone can edit. Wikimedia — Wikimedia is owned and operated by the Wikimedia Foundation, a non-profit foundation dedicated to bringing free content to the world. Urtak — Urtak is an easy way to get more response to your content. Graphicly — Graphicly is a place for all people that, like us, love the art and story telling that lives within the pages of a comic book or graphic novel, and enjoy nothing more than sharing that enthusiasm with their friends. Ganxy — Ganxy is the simplest way to buy and sell digital content on the web directly from any website, including music, video, articles, eBooks, software, and more. Behance — Behance is a platform for creative people and teams to showcase and discover creative work. JD Supra — JD Supra is a repository of free legal information shared by the professionals who generate it. Find legal documents, legal forms, court filings, articles and legal research. Minilogs — Minilogs is a new way to collect and share anything you like on the web. Sketchfab — Sketchfab is a web service to publish and display interactive 3D models. No plugin required: upload your model, embed it, share it, done. jsFiddle — jsFiddle mootools shell, easily test your snippets before implementing. Ponga — Ponga is a platform that lets users put content and applications into images. Ponga pictures allow users to communicate in a compelling visual format that drives engagement during both the creation and viewing of images. Listly — Listly – Lists made easy + social + fun!. We help bloggers and brands curate, crowdsource, and engage readers via live embedded list content inside blog posts. Crowdmap — Crowdmap is an incredible social mapping app. It allows you to connect and share with friends, make your own maps and collaborate with people all over the world. IFTTT — IFTTT is a service that lets you create powerful connections with one simple statement: if this then that. Weavly — Weavly is an easy to use tool for creating stunning video mashups and a great community for sharing your remixes. Tagmotion — Create a customized video highlights index for your topic area or Youtube channel. Jump straight to the relevant start points inside videos from your search results. Cloudup — Share streams of anything – video, photos, music, links and files – instantly and easily. Hackpad — Smart collaborative documents. Personal notes. Classroom collaboration. Talely — Talely is an online platform that enables everyone to easily create, publish and share engaging interactive digital stories that can be viewed in all devices. Polar — Polar is a super-fast and fun way to collect and share opions on just about. Bubbli — Bubbli is the app for making dynamic spherical photos with sound called. Imajize — Imajize is a fully hosted 360° image viewer for 360° product photography. Giflike — Giflike is a platform that simplifies the creation and consumption of .gifs. RapidEngage — RapidEngage is solving the problem of increasing website engagement. Infomous — Infomous turns text into an interactive visualization that gives users an instant snapshot of what is trending, and then lets them explore what is relevant to them. Stepic — Stepic is an educational engine with theory and quizzes. Tapestry — Tapestry is an ever-growing collection of short, beautiful, tappable stories. Chirbit — Chirbit is a social audio platform that enables you to share your audio. Polstir — Engagment tools for brands and publishers that measure sentiment and dialogue. Medium — Medium is a new place on the Internet where people share ideas and stories that are longer than 140 characters and not just for friends. Yfrog — yfrog is a service run by ImageShack that lets you share your photos on and videos on Twitter. Flickr — Flickr is an image and video hosting website, web services suite, and online community. TwitPic — TwitPic lets you share photos and videos on Twitter. Imgur — Imgur makes sharing images with the Internet easy. It can be used to share pictures with friends, as well as post images on message boards and blogs. You can manipulate the image a number of ways and automatically submit it to popular sites such as reddit or digg. You can also view popular user-submitted images in the gallery. Best of all, Imgur is completely free. .
TwitGoo — Twitgoo is a quick, easy, reliable, and safe way to share images for Twitter. Photobucket — Photobucket is the premier site on the Internet for uploading, sharing, linking and finding photos, videos and graphics. Your free Photobucket account can store thousands of photos and hours of video. Mobypicture — Mobypicture – Share your mobile adventures directly with one click to Twitter, Flickr, Netvibes, Tumblr and many, many other social platforms. xkcd — A webcomic of romance, sarcasm, math, and language. A Softer World — A Softer World is a comic that was created by Emily Horne and Joey Comeau so that people would recognize them as important artistic geniuses. Sometimes the \comic\ is sad or harsh. It should be noted that this is in the tradition of George Simenon’s ‘romans durs’ (or ‘hard novels’) and not in the lesser traditions of comics like Peanuts or anything else not French. 23 — 23 is the visual sharing company. Keep all your photos in one safe place. With 23 you can organise the photos, share them with anyone you want, and you can even order real prints of your digital photos. Dribbble — Dribbble is show and tell for designers, developers and other creatives. Share sneak peeks of your work as \shots\ — small screenshots of the designs and applications you’re working on. SmugMug — The ultimate in photo and video sharing. Easily create online photo albums. Share, store, organize and print. Picasa — Fast and easy photo sharing from Google. Share with friends and family, or explore public photos. Tinypic — Tinypic is a fast, simple and reliable video and image hosting site that you can use to share your experiences. meadd — Flog 5 photos per day, unlimited comments, unlimited titled images and more. fotopedia — Fotopedia is breathing new life into photos by building a photo encyclopedia that lets photographers and photo enthusiasts collaborate and enrich images to be useful for the whole world wide web. photozou — Photozou, is a Japanese photo sharing site for social media. instagram — Instagram, a fun and quirky way to share your life with friends through a series of pictures. Snap a photo, then choose a filter to transform the look and feel of the shot into a memory to keep around forever. Skitch — Skitch.com is a webservice that works hand in hand with our application Skitch to give you 1-click uploading of images for fast and fun image sharing. Questionable Content — Questionable Content (or \QC,\ as it is frequently abbreviated) is an online comic strip that is ostensibly about romance, indie rock, little robots, and the problems people have. TwitrPix — Social photo sharing site. someecards — Someecards may or may not be the greatest thing since ecards. It was created by Brook Lundy and Duncan Mitchell and a dollar and a half-assed dream. Achewood — Achewood is a webcomic created by Chris Onstad in 2001. It portrays the lives of a group of anthropomorphic stuffed toys, robots, and pets. Many of the characters live together in the home of their owner, Chris, at the fictional address of 62 Achewood Court. WhoSay — WhoSay is a service that helps artists, athletes and iconic personalities connect with their fans. Ow.ly — Ow.ly – Shorten urls, share files and track visits. mlkshk — Easily save images from everywhere on the web. .
Lockerz — Lockerz’ mission is to be the homepage for men and women ages 13 to 30, building a community of trendsetters and tastemakers who love to shop, play and connect on the Web. Droplr — Droplr is the easiest and best way to share files, large and small, over the internet. Period. EyeEm — EyeEm is a smart photo-sharing and discovery service… Whenever you take a photo, we try to simplify the process of tagging it with an activity and a location by suggesting defaults to you based on a variety of factors (where you are, what time it is, what other people do there, etc)… With every photo you upload, we learn a little more about what you like and can recommend photos places and things that you’ll find interesting. Giphy — Giphy – Search Animated Gifs on the Web. Frontback — You, and what you see. Viddme — Viddme lets anyone upload videos instantly with no account required. We help content creators by simplifying the creation process, and giving them better tools to engage with their audiences. Amazon — Amazon.com is a leading global Internet company and one of the most trafficked Internet retail destinations worldwide. Amazon directly sells, or acts as a platform for the sale of, a very broad range of products, including books, music, videos, consumer electronics, clothing and household products. ShopStyle — ShopStyle is the online equivalent of browsing the aisles of the world’s most fabulous store. Apple — iTunes is a free application for your Mac or PC. It lets you organize and play digital music and video on your computer. It can automatically download new music, app, and book purchases across all your devices and computers. And it’s a store that has everything you need to be entertained. Anywhere. Anytime. Etsy — Buy and sell handmade or vintage items, art and supplies on Etsy, the world’s most vibrant handmade marketplace. Share stories through millions of items from around the world. Fiverr — The world’s largest marketplace for small services, starting at $5. SoundCloud — SoundCloud lets you move music fast & easy. The platform takes the daily hassle out of receiving, sending & distributing music for artists, record labels & other music professionals. Spotify — Spotify is a new way to listen to music. Spotify Millions of tracks, any time you like. Just search for it in Spotify, then play it. Just help yourself to whatever you want, whenever you want it. Last.fm — Last.fm – Listen to free music with internet radio and the largest music catalogue online. Mixcloud — Mixcloud is re-thinking radio. Listen to great radio shows, Podcasts and DJ mix sets on-demand. Upload and promote your own Cloudcast for free. Radionomy — Radionomy, everyone can finally create his radio on the Net! It’s all so easy. By browsing through our vast music and content libraries. By integrating one’s musical creations or excerpts from one’s record library. And one’s own audio content, sequences, reportages. Hark — Hark is an Internet media company that is changing the way people express themselves through creating, sharing and listening to entertaining, informative and timely sound bites online and through mobile devices. Rdio — Unlimited Music. Everywhere. Choose the music you want to play and listen as much as you want – from the web or your phone, even when you’re offline. zero” — zero” [speak: zero inch] is a specialised digital record store featuring electronic music and other related styles. They are based in Vienna and Berlin. Band Camp — Bandcamp is an online music store, as well as a platform for artist promotion, that caters mainly for independent artists. Free Music Archive — The Free Music Archive is an interactive library of high-quality, legal audio downloads. The Free Music Archive is directed by WFMU, the most renowned freeform radio station in America. NPR — A thriving media organization at the forefront of digital innovation, NPR creates and distributes award-winning news, information, and music programming to a network of 900 independent stations. Through them, NPR programming reaches 27.2 million listeners every week. Huffduffer — Create your own podcast: find links to audio files on the Web; huffduff the links (add them to your podcast); subscribe to podcasts of other found sounds. AudioBoo — A mobile and web platform that effortlessly allows you to record and upload audio for your friends, family or the rest of the world to hear. xiami — Xiami is one of the largest music providers in China, on Xiami you can search with friends and share your favorite music. SayNow — SayNow set out to build voice-based experiences that are fun and social. Along the way, we reinvented the way phone calls are made today. Voice is engaging, authentic, and an emotional form of communication, yet is largely ignored on social media and smartphone platforms. Grooveshark — Grooveshark is an internationally available online music search engine, music streaming service and music recommendation web software application, allowing users to search for, stream, and upload music free of charge that can be played immediately or added to a playlist. RadioReddit — radioreddit.com is the source for quality new and popular independent music. gogoyoko — gogoyoko is a social music marketplace where music fans can buy directly from the artists. The Hype Machine — The Hype Machine is the most popular music on blogs right now. bop.fm — bop.fm creates a home for every song on the internet so you can easily share it with anyone on any service. Clyp — Share and discover the world of audio. Clyp is a free, simple and fun way to share the sounds in your life with friends and family. ESPN — ESPN.com provides comprehensive sports coverage. Complete sports information including NFL, MLB, NBA, College Football, College Basketball scores and news. ABC News — ABC News brings you the latest breaking world news, national news, political, business and entertainment news, as well as stories from 60 Minutes and the Early Show. Washington Post — Washington Post Digital brings Washington to the world and the world to Washington. Boston.com — Boston.com is the exclusive online home of The Boston Globe. We take pride in our up-to-the minute news and features such as dynamic sports coverage, arts and entertainment, weather and traffic. Facebook — Facebook helps you connect and share with the people in your life. CNBC — Find the latest stock market news, information & headlines. Get up to date business news as well as stock market, financial & earnings news online. View world markets streaming charts & video; find stock tickers and quotes on the official CNBC site. CBS News — CBS News brings you the latest breaking world news, national news, political, business and entertainment news, as well as stories from 60 Minutes and the Early Show. Google Plus — Connect with friends and family. Add friends and family to see what they’re sharing (and share a few things back). You can search your email contacts to quickly find people you know on Google\\+. Or find people from your high school, college, work or hometown to swap stories with. CNN Edition — CNN.com International delivers breaking news from across the globe and information on the latest top stories, business, sports and entertainment headlines. Follow the news as it happens through: special reports, videos, audio, photo galleries plus interactive maps and timelines. NBC News — NBCNEWS.com for breaking news, original journalism and videos. Stay current with the latest world news, business headlines, health, sports & entertainment. Global Post — GlobalPost has been one of the leaders in the movement to create new, more sustainable models for journalism at a time when news organizations everywhere are struggling with historic forces of change driven by technology, new consumer habits, and an eroding economic support system for traditional media. The Guardian — Guardian, a British national newspaper with the world’s leading liberal voice. Find your Latest news, sport, business, comment, analysis and reviews. Bravo Tv — Bravo Tv – includes shows Top Chef, My Life on the D-List, the hit series Shear Genius, Million Dollar Listing, The Millionaire Matchmaker, Tim Gunn’s Guide to Style, Make Me A Supermodel, and the water cooler sensations that are The Real Housewives. National Geographic — View hundreds of free videos from National Geographic, featuring animal videos, weather videos, nature videos, world music videos and other most popular video content including shark videos. Discovery Channel — Discovery Channel online lets you explore science, history, space, tech, sharks, & more, with videos & news, plus exclusives on your favorite TV shows. Forbes — Forbes.com Video Network – The leading source for reliable business news and financial information. Distrify — Distrify is a powerful suite of digital tools that turn the entire internet into a movie marketplace. Fox News — Breaking News, Latest News and Current News from FOXNews.com. Fox Business — Fox Business, Business News & Stock Quotes – Saving & Investing. Reuters — Reuters.com brings you the latest news from around the world, covering breaking news in business, politics, entertainment, technology, and more in video and pictures. Huffington Post — The destination for news, blogs and original content offering coverage of US politics, entertainment, style, world news, technology and comedy. The New York Times — Find breaking news, multimedia, reviews & opinion on Washington, business, sports, movies, travel, books, jobs, education, real estate, cars & more. the embed works fine, player sits in new post and plays with no problems every time, only problem is the preview thumbnail (or lack of! ), I’ve noticed if I’m logged into google with my hosting account they all display fine on the WP site, that’s fine for me! but if anyone else views the site you just get a player with a white\grey background with a play button in the center. if i log out of google the same thing happens in my browser also. have you heard of this issue before? I’ve been trawling for a few days but not seen much with regards a way around it. 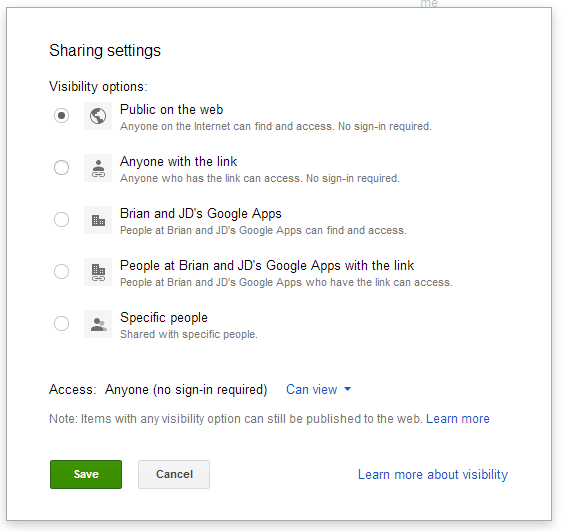 its clearly a sharing issue of some sort with google. really annoying, kinda spoils the look of the site with blank grey boxes in all of the video posts! From what I have seen, the only way to set a dedicated thumbnail for a Google Grive file is for the uploading app to do so as described in Uploading thumbnails. It sounds like wherever the thumbnail used in the preview is stored is not in a “Everyone including unlogged in” folder. in case the thumbnail is stored in a hidden folder below the video’s container? Thanks for the speedy reply, and your assistance, I have tried moving the videos to a folder, initially I had the videos sitting in the root of my google drive, but moved one as a test into a newly created folder then shared the video (and folder) as you suggested, same results I’m afraid.